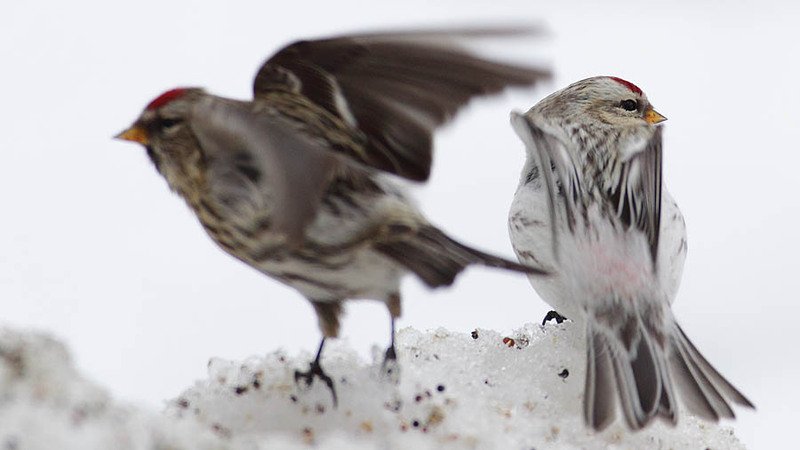 Despite the fact I have several more pressing and important things I need to do, I just couldn't ignore these Redpolls from my Cochrane trip. I've bee studying the images, and everything is fresh in my mind. The time to write is now! But yeah, I'm not done writing yet. Hopefully in a day or two, I'll have a new addition in my series of having fun while identifying really confusing birds. Part of the process involved getting my images online. After a super-fantastic fall of photographing Jaegers in the zodiac, I decided to expand the Gull pages to be the Gull and Jaeger pages! Then I continued my assault on Cackling Geese, and have future plans of getting lots of Cackler pictures online to help solve their mystery. But Redpolls? They aren't even waterbirds. It was time for a name-change and a broader focus. 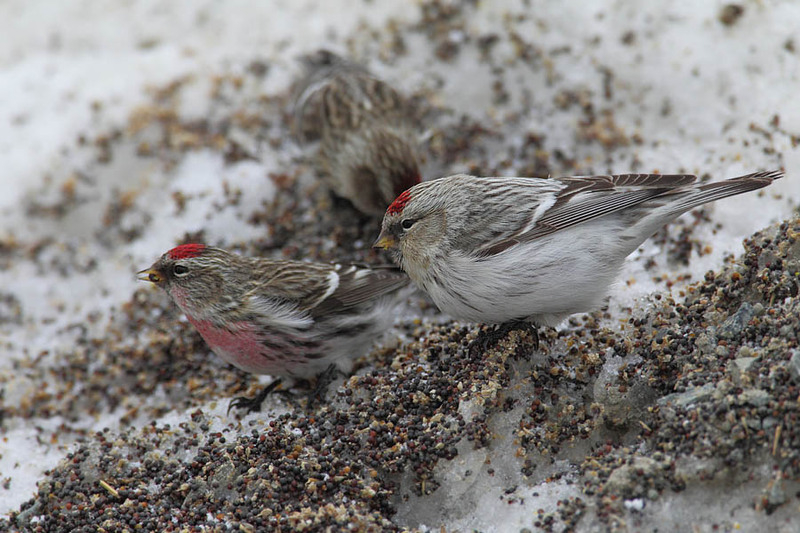 For now........... Southern / exilipes Hoary Redpolls from northern Ontario. 34 pictures to simply document what these things can look like! I've been home for a few days, but figured I would post some sort of conclusion to my mini-trip. I usually plan some sort of extravagant adventure in the winter months, but the disastrous state of my website and personal affairs had/have kept me couped up inside for too long! It was time to do some driving in search of bird-related goodies. 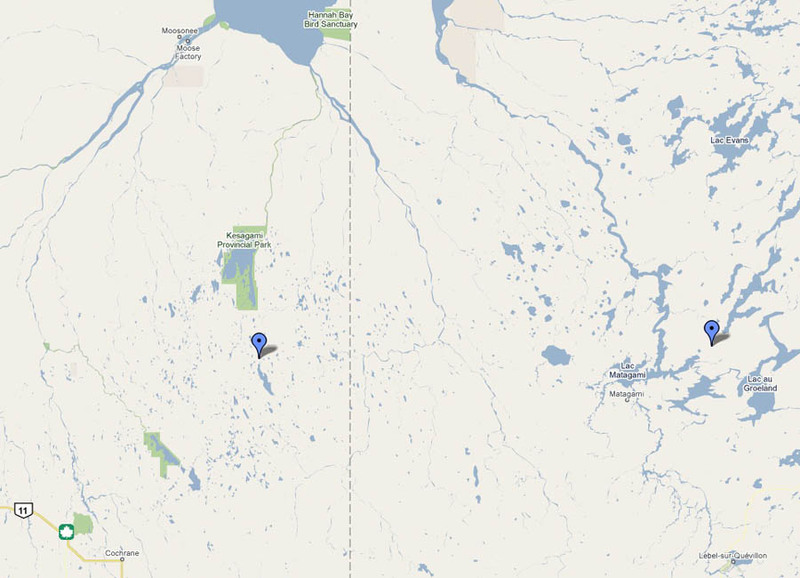 - Wake up Friday, and check Lake Temiskiming (cobalt etc) and then drive some lesser known roads towards Cochrane. Stay in pre-booked hotel in Cochrane. 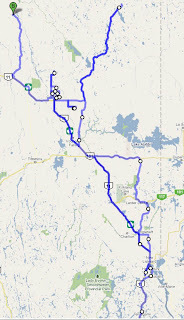 - Saturday I checked the farmland north of Cochrane, then drove up hwy 11 and towards Abitibi Canyon (point B on the map), the farthest NW I managed to get from home. Back to same hotel in Cochrane after dark. - Sunday I drove NE towards the Detour Lake Gold Mine. I didn't make it to the mine (becomes a private road 30km away).. But still got pretty far (the NE point of my travels) I then drove some backroads until later in the afternoon when I made my break for home. Arrived in Guelph around midnight! (Above - The farthest NE I managed to get on my travels, half way to James Bay from Cochrane! 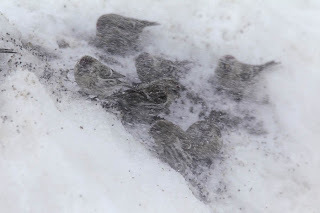 The blue point in Quebec is the location of 2 Willow Ptarmigan reproted in Quebec on the same day! Friday - already covered earlier. 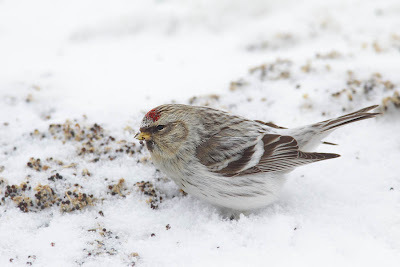 Slow until I saw the Lynx.. Then found the redpolls feeding and took 1000 Hoary Redpoll pictures over the next 5-6 hours, while freezing in my car. A major success! Fun fact: the drive on Saturday to Abitibi Canyon is 75km north of Hwy 11. On the ENTIRE 150KM drive, I didnt see a SIGNLE BIRD!!! Boreal forest at its best. So yeah! A pretty awesome 3 day trip to the north. I spotted a decent percentage of the species one would expect in a place like Algonquin Park, but add in the numerous Hoary Redpolls, a Lynx, a Gray Wolf, and the excitement of birding some really unknown places --- it really makes me wonder why more people don't go there! 1 - number of times I got temporarily stuck while driving. In the middle of a sheet of ice.. Wouldn't move in any direction until I put some salt down! 0 - number of snow tires on my little Toyota Echo! This car is unstoppable. 75 - number of times I thought about writing a diet-birding book. If you only bring lettuce, apples and crackers 150km down a mining road - you're going to eat Lettuce, Apples and Crackers and be happy about it! 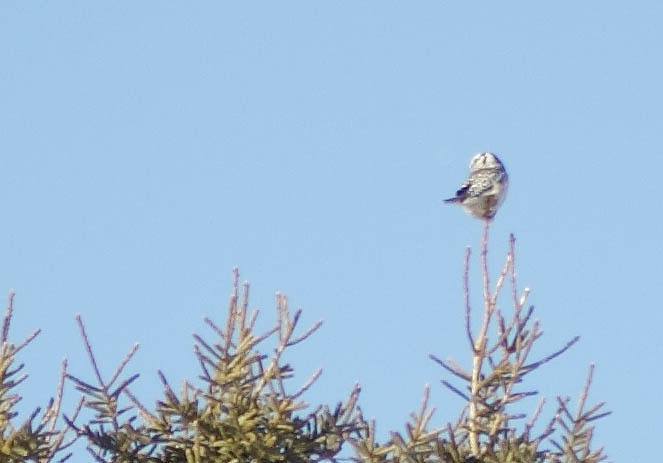 My Northern Hawk Owl from the adventure. I actually had really amazing looks, just didn't bother to put the big lens on the camera. - position camera out window in proper position for shooting. Now all I had to do was get back to the spot where the wolf was! In order to shoot out the drivers side window, I decide to go in reverse (with my camera half out the window). Thankfully there was virtually no traffic anywhere on this road, and the plan seemed like it was going to work. The car comes to a stop and the confusion begins. 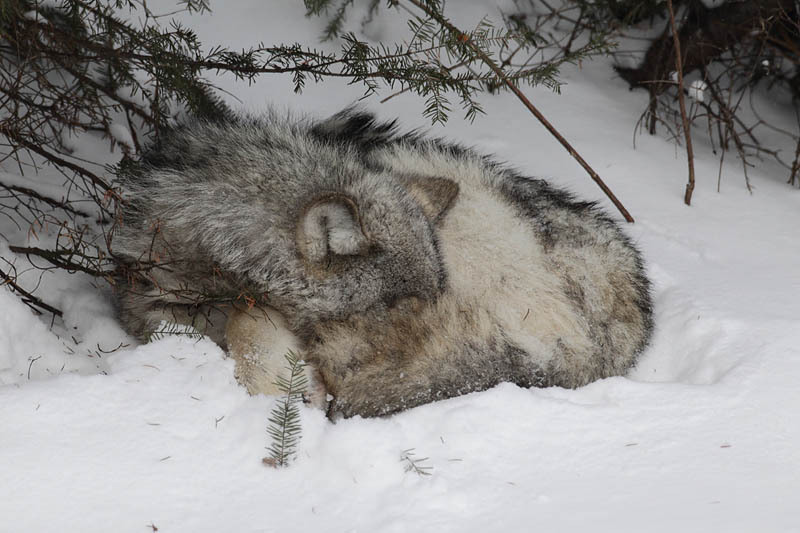 The wolf is still sleeping, and i'm not 40ft away. I snap a few photos, and begin to think of this situation. We experience a rush when seeing a rare animal like this for that exact reason; it is very rare to encounter them anywhere! Their mystique fascinates us. If they showed up under our bird feeders and ate our birdseed, many would end up trying to deter their presence. 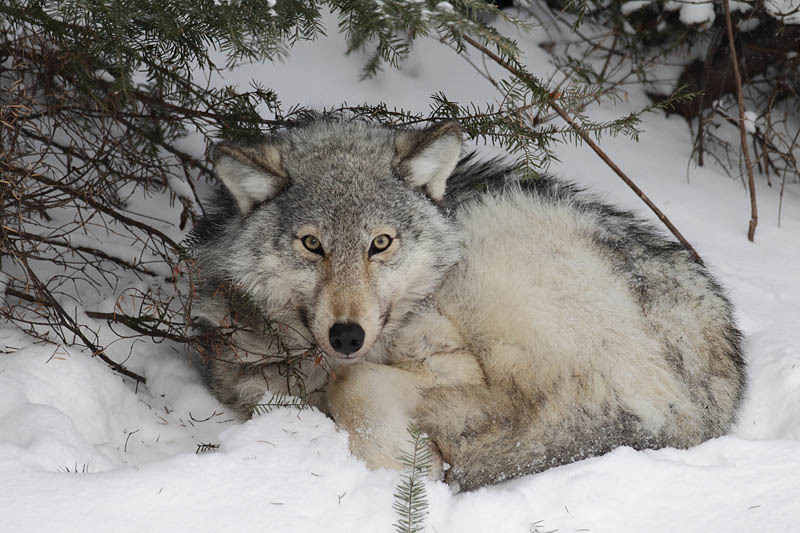 A wild/happy/healthy Wolf is generally away from human eyes - so what's going on here? Working in Algonquin Park for a few summers taught me that enough people can eventually tame just about any animal. They can really make a photographers day. I had a fantastic encounter with a Black Bear, taking dozens of photos, as it ate roadside berries 30ft off of the highway with 25+ people watching. Had someone been feeding this Wolf? Causing it to prowl the sides of the road looking for handouts? The wolf then raises its head. Maybe it was in the back of my mind the entire time, but it is better to ignore it until proven otherwise. A magnificent creature (a "life mammal" for myself) making a living in the seemingly lifeless environment of the boreal forest in winter. More often than not, views like this come at a price. The wolf starts to stir, and all of the surprise/excitement/mystique fades into rather harsh understanding. It can barely get to its feet, and is clearly either gravely sick or badly injured. It's not sadness that replaces all of my emotions (well, maybe a little) but mainly understanding. I've seen this many times before while out enjoying nature. This magnificent beast is reaching the end of its line. * (Hwy 652, towards the Detour Lake Gold Mine) - pretty darn far north! ** hot air out the car window makes pictures blurry. It has to be COLD inside the car to get the shot! Bird A is on the far left, bird B is on the far right. Bird B (left) with female "southern" Hoary Redpoll, right. 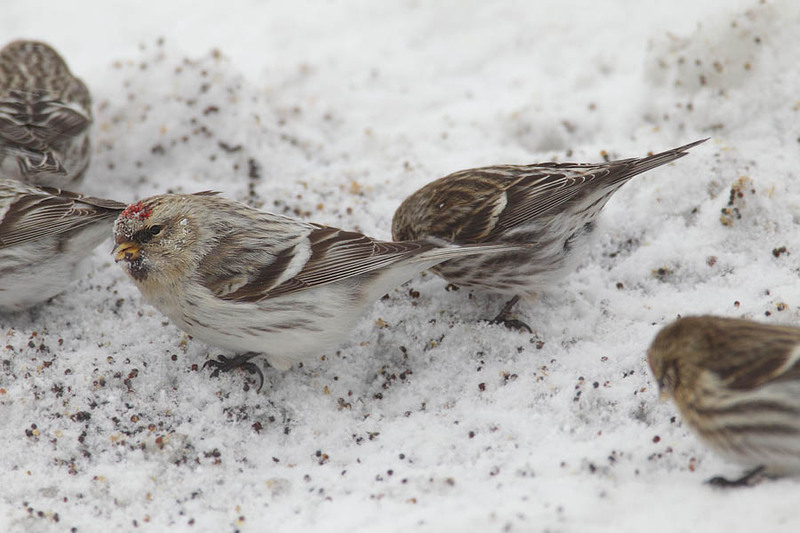 Yay for Redpolls.. They're more confusing than Gulls! Mmmm Hoaries.. Ok time to sleep! 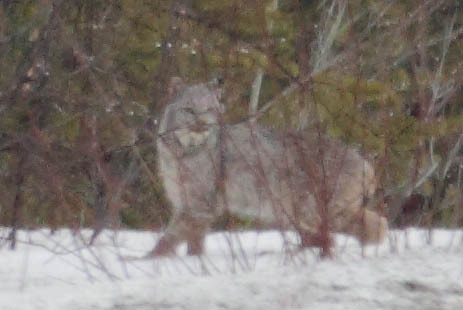 Yes, that's a Lynx. I saw it crossing the road, slammed on the breaks, and managed a yelp to catch it's attention (for a photo) before it walked into the woods.). What a crazy cat! On the drive I saw a Ruffed Grouse, a dead Spruce Grouse, and a dead grouse sp. Maybe a good year to be a lynx! Note, that should be """Hornemann's" Hoary" Redpoll"
I'm a self professed Hornemanns skeptic, but I have a feeling that this blog will have some redpoll chatter over the next few weeks when I get my images in order. 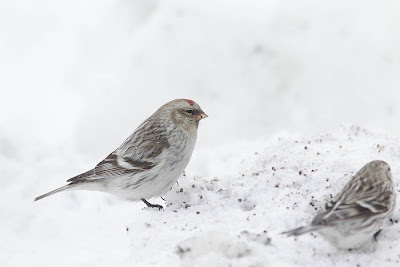 For now, here's the two birds that best matched proposed field marks for finding oneself a "Hornemann's"
Far left and far right birds, the two biggest redpolls in the flock (with 3 "southern" common Redpolls here). Yes the magic of photoshop combined 5 pictures to make this one, but I used the seeds to line up the images, so the birds location and size to each other should be fairly accurate. It was the only time I saw these 2 close together, and this was the best I could do for a photo. 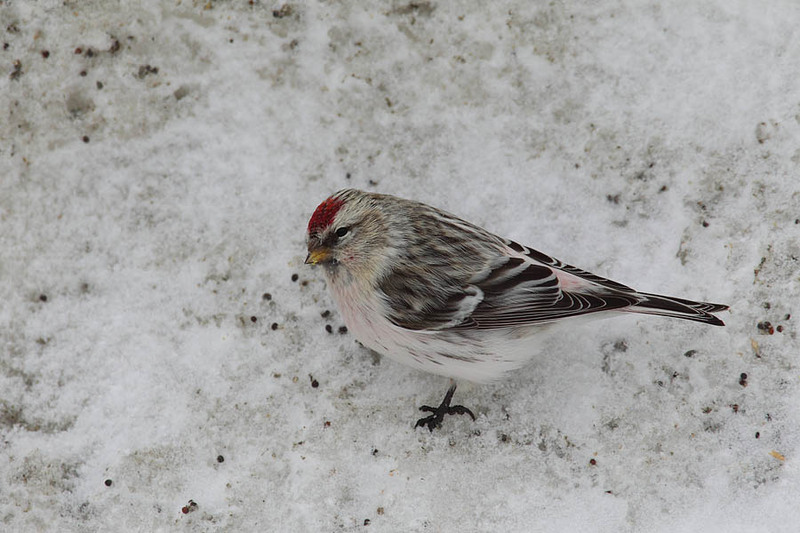 Anyways, Redpolls are more confusing than gulls, so stay tuned for more photos of more odd birds. Anyways, I jest. There is some really neat pictures being posted on the weather network, if you know how to find them. It's unfortunate that the whole thing is just a free-picture grab scam by the weather network (read the fine print on what they can do with the pictures you post) ... but it is fun. 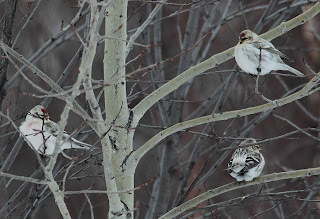 Yes I wrote that owl thing a few days ago.. Back to Redpolls and ready for birding tomorrow!!!!!!!!! Yes, there are still a few links that don't work - but with 1000+ pictures online - I'm in a happier place! There is still a lot of work to be done, but this is the end of phase 1 of my photography revolution! --- maybe someday take some better passerine photos (projects like this make me realize that a lot of my songbird shots are barely passable). amazing photos (China) of the critically endangered Spoon-billed Sandpiper! What do you think of the change in colours for the blog? --- larger files... Hopefully a big page like this doesn't take too long to load? --- the reason for bigger files. I really like pictures with some space around the bird, but now there is still some detail too! Unfortunately making these pages is taking longer than I hoped (maybe 50 pages/day?) but it's happening! Never fear, almost-decent blog material is on the way. 1010 pictures re-sizes later, I'm actually starting to look at Dreamweaver..... Nothing fancy in the near future, but something might happen. Maybe a bit mean, but I laughed. Obviously the big thing for me is the rarities they`ve been finding. This was an email I wrote a while ago, but I figured it would also make for good blog material. 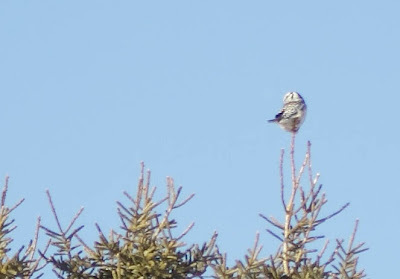 June 17, 2002 - 2 singing Blackpoll Warblers, 500 hawks! Oct 5-8, 2003 - nothing! May 26-30, 2005 - Snowy Egret, 3 different Swainson`s Hawks!!! Early June, 2006 - (Jun 11/12?) - Say's Phoebe! Oct 2009 - 4 days in early Oct - Carolina Wren! So yeah! Caribou Island would be the destination for Ontario birders. I have no plans to get there anytime soon, but I'm sure one day I'll get there. It is a lot more difficult to get to Caribou than Manitou! 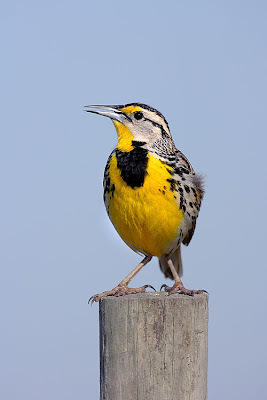 Not only are there new species (that you don't have at home) when travelling to see and photograph, but "regular" everyday species from home (like this Eastern Meadowlark) seem like totally different birds in Florida. Adult Yellow-legged Gull from St. John's Newfoundland. There's something about this image that I really like, and picture number 500 prepared for the new website. The only bird news on my mind right now is Willow Ptarmigan. 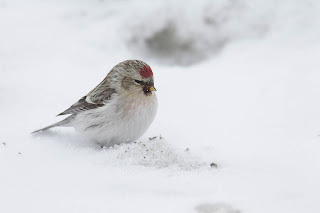 This bird laughed at every one of my feeble attempts to find it while in Newfoundland, and the fact that multiple birds have traveled south of their normal range (into Quebec) has caught my attention. My hopes of finding time to photograph Eiders in Norway this winter is dying more and more every day - but a trip around Northern Ontario could be enough to get my fill of cold weather birds... And if I could turn up a Ptarmigan up there, it would really be something! Scroll down to the Jan 29, 2011 entry for a great picture and some info (french) on the beasts. Food for thought on a snowy day! Even more birding! I spared the morning to head out with my dad to the lake. We tested the 30kmh NNE winds at Van Wagner's for a few hours, and saw 4 Glaucous Gulls fly past... Not really top quality birds, but what can you do? Windemere Basin/Red Hill Creek was another stop - with the expected highlights: Great Blue Heron (5). Black-crowned Night Heron, Ring-necked Duck, Northern Shovellers, Coots, Northern Pintail, Hooded Mergs, 2 Iceland Gulls, 2 Glaucous Gulls, Cormorants, Ruddy Ducks, and my species #103 for my year list - 3 Green-winged Teal. 40 knots!! Why didn't this happen in mid September? 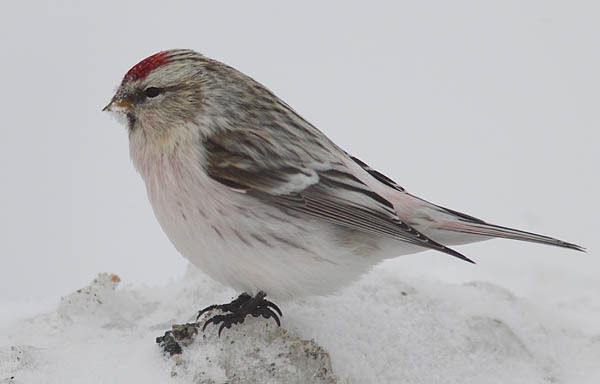 Jenn and I found ourselves in Waterloo yesterday (Jan 30th) - and decided to make a run for some good birds in the area. Most notably - the Varied Thrush that has been present since sometime in December. Nice bird! We parked in the driveway, waited a while (saw some woodpecker squabbles) and the thrush put on a great show eating peanuts not far away. Beautiful creature! We also made a quick stop to see the Hawkesville Red-shouldered Hawk... 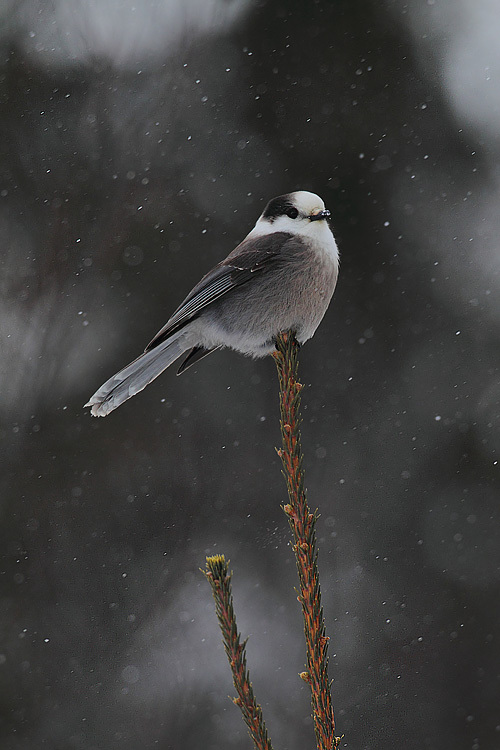 The bird has been here every winter for several years now, but it's the first time I found myself in the area. We found the bird quickly, and it gave some really nice views. Beautiful bird! Going to poke around in this snowstorm tomorrow for a rarity or two. It's a terrible time of year for rarities, but you're not going to find anything if you're not out looking! And I always enjoy a good storm. - Glaucous-winged Gull in Illinois... THEEE most overdue bird for Ontario. 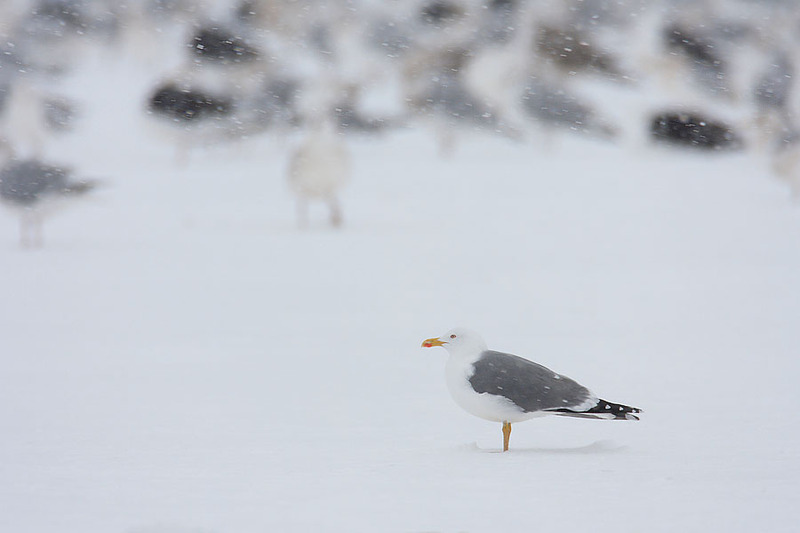 - Slaty-backed Gull in Illinous... not fair! - Golden Eagle going after a deer in illinois!? I noticed this when looking up pictures of the gulls.. Crazy!